when you spend your birthday at disneyland. 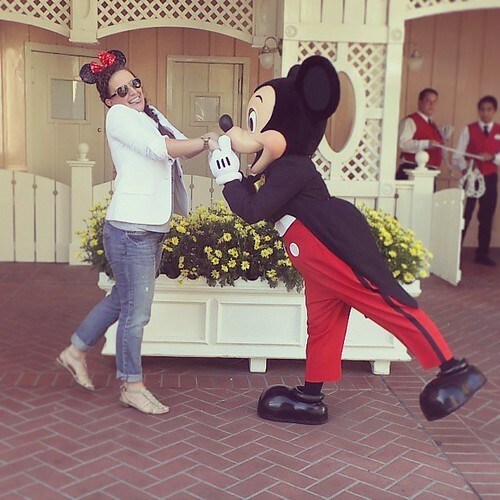 My birthday at Disneyland was everything I dreamed a birthday at Disneyland could be. Some people thought I would be lonely. Other people thought I was crazy. Tracey met me early on and we both peed a little on Tower of Terror. Afterwards she took me to lunch and it was the most perfect segue into the rest of my day. I met Mr. Origami, Alexander, who just so happens to share the same birthday as me . (He guessed I was 26. Bless you Alexander.) He gave me a little purple origami box I put my ticket in when I got home. I befriended an eight year old named Wallace in a single rider line, I kind of wanted to set him up with Addie. He planned out the rest of my day for me and when I told him I was planning on eating ice cream for dinner I could tell I solidified adulthood as being awesome in Wallace’s mind. Thanks to my birthday button I was wished ‘happy birthday’ no less than a hundred times and it never got old. I can remember walking behind Addie on her 8th birthday aboard the Disney Magic, every crew member who saw her wished her a “Happy Birthday, Princess!” in their native language. I could see her stand a little taller every time they did. One of the things I love most about that kid is her inability to mask emotion, turns out I may be where she got it from. It’s official. Disney can become even more magical when combined with your birthday. Thanks for the memories Disneyland, you’re simply the best. Your hair is so long and gorgeous! Yeah, that’s my first comment. I thought this was a great post. I think that society tells us we should take solo vacations when we’re in our 60s, but it may be even harder when we are younger. I’m looking up to you with inspiration now! @Casey, Say whaaa? Well now I definitely want details. So pretty! Did you do the fancy-pants braid? @Lindsay, No, no, no. Mindy from CuteGirlsHairstyles.com did it. She has SKILLS. OH MY GOSH! What an awesome birthday! Yay Disney and Happy Birthday Casey! @Charlane, Thank you! It was SO much fun. 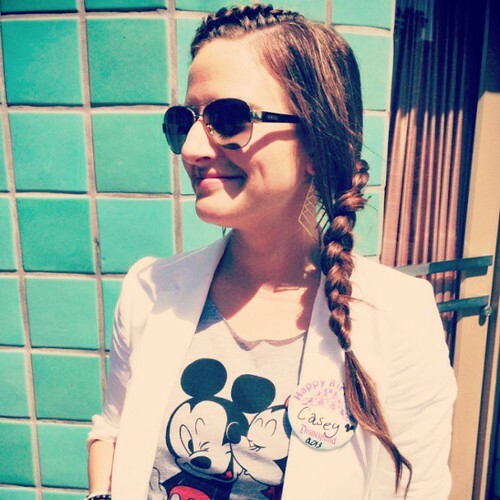 It has always been my dream to celebrate my birthday at Disney (Land or World – I’m not picky). You have made it a permanent fixture on my bucket list. @Katie, Oh yes. It must be ON your birthday, otherwise it’s not the same. we did Disney for our Birthdays two years ago. So much fun! The we would be my husband and I. Our Birthdays are one day apart. @saramd, How fun! Double buttons! 1. I’m going to Disneyland with a friend for her bday in July and I sent her this link because I’m so excited. 2. I love how you did your hair. 3. I love your Mickey & Minnie shirt and if I see it I may buy it. 4. What did you edit your video with? I loved it, makes me want to take way more videos except I’m not sure if my editing skills are remotely that good. 5. I laughed so much at you on the Tower of Terror. There is no way I could ungrip the wall next to me (I insisted on sitting next to the wall when I went) to be able to video tape myself. 2. Mindy from @cutegirlhair did it, I don’t get any credit. 5. I love that ride. It’s stupid how happy this makes me. @Joules, Dude, I may have looked like a creep walking around smiling and talking to myself all day. Disney is the best place ever to spend a birthday. Glad you had a blast. Happy belated!!! @Jess, It seriously is, I mean, I knew it would be good but I didn’t know it would be THIS good. Yay! You are delightful & lovely & I just love that you had a delightful & lovely birthday. I would spend any day at Disney. The staff are amazing, and I love the way the make a birthday extra special. I don’t know why I am unable to subscribe to it. Is there anyone else having identical RSS problems? Anybody who knows the answer will you kindly respond? Thanks!! Oh please…you somehow think I’ve never had ice cream for dinner? Though I have moved on from hot fudge to Coldstone’s Chocolate Devotion. Call me? Write me? K? I’ve decided that I NEED to be at Disneyland on my birthday next year. You’ve just convinced me of something I always knew but never realized.